The sun is heating up an active region just for us, it is flaring a bit early, but since I think we’re looking at an equatorial magnetic shift – see the “ring of fire” around the waist of the sun? 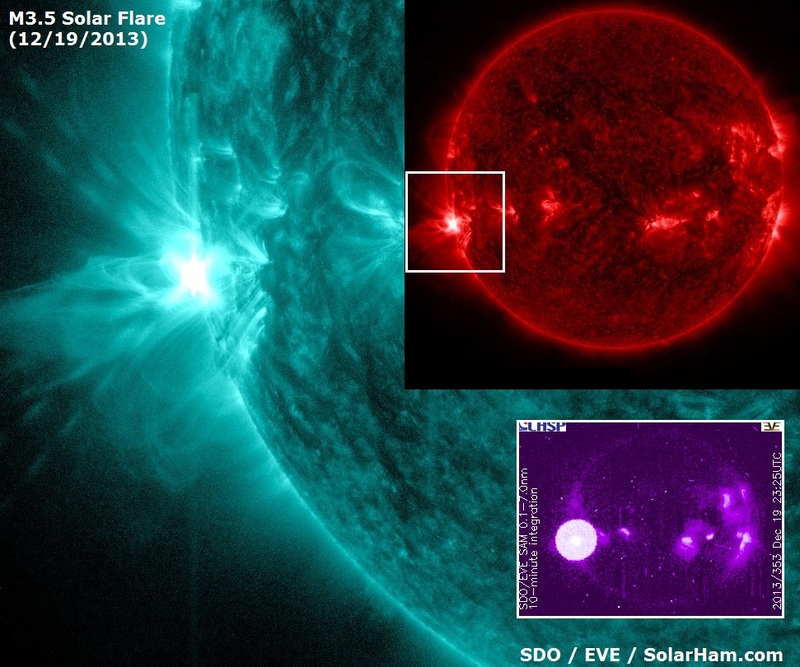 – We’ll have solar flares for Christmas. I’m a little disappointed that the Kp is low. General trending indicates that we won’t cross the yellow during a significant CME. i.e. You won’t see aurora unless you live uncomfortably near the north pole, then you shouldn’t go outside. For an example of Antarctic Weather. Overall, what is the worst that could happen? Well, keep an eye on Kp, if it runs red and no one is paying attention, we could lose some satellites, have some communication and power issues in the north. If there is bad weather plus bad space-weather and a power failure…well… that would be bad. NOT EXPECTING IT – but (if you are up north) watch your Kp nonetheless. And now we come to the last volume of the Displaced Detective series currently in print; don’t worry! There will be more! The Case of the Cosmological Killer: Endings and Beginnings finishes the story that The Rendlesham Incident began. 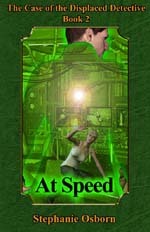 Holmes and Skye find they have not one, but two, very serious problems facing them. Not only did their “UFO victim” most emphatically NOT die from a close encounter, he was dying twice over – from completely unrelated causes. Holmes must now find the murderers before they find the secret of the McFarlane farm. And to add to their problems, another continuum – containing another Skye and Holmes – has approached Skye for help to stop the collapse of their own spacetime, a collapse that could take Skye with it, should she happen to be in their tesseract core when it occurs. Skye was sleeping peacefully in their bed in Gibson House, and Sherlock was deep in her hyperdimensional equations, reviewing them with all the grey matter he possessed, when a whiff of ozone reached his nostrils. “I am glad to hear it,” Sherlock said softly. “Is that her work you were looking over?” Chadwick asked Sherlock. “Can you make anything of it?” Holmes wondered. “Might I make a suggestion?” Sherlock offered. There was a brief silence, and Sherlock could picture Chadwick gazing at Holmes with a sort of grateful, wistful expression. Open your eyes, man, and see the treasure you have in front of you, before it is too late, he thought with some vehemence. Eventually Chadwick spoke again, and this time there was a soft smile in her voice. “As much as in me lies,” Sherlock nodded. “Which is considerable,” Chadwick chuckled. The air crackled, another surge of ozone wafted through the room, and they were gone. Hope you enjoyed it, and check out my website for purchase links, or go directly to Amazon! Cassini has supplied us with tons of radar data, which has been compiled to generate this flyer video. I love looking at Titan, I hope to move there someday… wish it were warmer, but we work with what we’ve got. 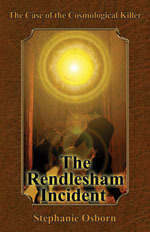 As we continue the promotion, this is the prologue to the third book in my Displaced Detective Series, The Case of the Cosmological Killer: The Rendlesham Incident, a science fiction mystery that continues Sherlock Holmes’ adventures in the modern day. They are: The Case of the Displaced Detective: The Arrival, The Case of the Displaced Detective: At Speed, The Case of the Cosmological Killer: The Rendlesham Incident and The Case of the Cosmological Killer: Endings and Beginnings. You can purchase all of them in pretty much any format you like through my website, www.stephanie-osborn.com. Hope you enjoy this excerpt. For more, or to purchase this and more books in the series, go to my website, www.stephanie-osborn.com, or to Amazon for the trade paperback or Kindle. Or buy The Case of the Displaced Detective Omnibus and get the first FOUR books in the series here! SO I may have mentioned that I like to swordfight. Well, here is me and Phillip killing each other. Actually, I believe my tip slides on his shirt, his catches on my shoulder piece. I’m the guy in the orange belt with the big breastplate. I didn’t lose them all, great picture below of the fight against Dragonet. He is durn good. Anybody ever interested in a swordfight, just give me a call…. 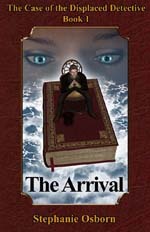 Be forewarned: The Arrival and At Speed comprise one story in two volumes. One book in either the science fiction or mystery genres normally averages around 100,000 words. But when the original idea for The Case of the Displaced Detective came to me, I cranked out 215,000 words in two months. And that was just the rough draft. In order to keep it to a manageable size, my publisher, Twilight Times Books, cut the manuscript in half and made two volumes out of it. As it happened, the second story in the series, The Case of the Cosmological Killer, turned out much the same. So the first four books comprise the first two stories. I swear they won’t all be like that! In fact, book 5, A Case of Spontaneous Combustion, is only one volume. “Aborting one attempt to sabotage Project: Tesseract, Sherlock Holmes — up to speed in his new life and spacetime continuum — and Dr. Skye Chadwick —hyperspatial physicist, Holmes’ new “Watson” — must catch a spy ring when they don’t even know the ring’s goal. Meanwhile Skye recovers from two nigh-fatal gunshot wounds. “A further complication is their relationship: the ups and downs between the pair are more than occasional clashes of demanding, eccentric personalities. Chadwick is in love with Holmes. Knowing his predilection for eschewing matters of the heart, she struggles to hide it, in order to maintain the friendship they DO have. Holmes also feels attraction — but fights it tooth and nail, refusing to admit it, even to himself. For it is not merely Skye’s work the spies may be after — but her life as well. Having lost Watson to the vagaries of spacetime, could he endure losing another companion? For more, or to purchase this and more books in the series, go to my website, www.stephanie-osborn.com or look on Amazon. Or buy The Case of the Displaced Detective Omnibus and get the first FOUR books in the series here! In view of the upcoming holidays for gift-giving — Christmas, Chanukah, Yule, Kwanzaa, etc., I thought I’d post a few excerpts from my books to whet your appetite. physicist, Dr. Skye Chadwick, discovers that there are alternate realities, and said alternates are often populated by those we consider only literary characters. Her pet research, Project: Tesseract, hidden deep under Schriever AFB, is her means of looking in on these continua. In one particular reality, continuum 114, a certain Victorian detective (who, in fact, exists in several continua) was to have died along with his arch-nemesis at the Reichenbach Falls. Knee-jerking, Skye intervenes, rescuing her hero, who inadvertently flies through the tesseract wormhole connecting his universe with ours, while his enemy plunges to his death. Unable to send Holmes back without causing devastating continuum collapse due to non-uniqueness, he must stay in our world and learn to adapt to the 21st century. This is book 1 of the series! Four are already published, with more on the way! For more, or to purchase this and more books in the series, go to my website, www.stephanie-osborn.com or find it on Amazon. Or to purchase The Case of the Displaced Detective Omnibus, consisting of the first four books, go here. I just want it clear. If you think that saving Santa’s Home on the Arctic Ice Sheet is a valuable ideal… I am mocking you. Santa’s home – if he lived at the actual North Pole – would be under water most years. (Even years with good summer ice.) You see, the sun warms the poles during the summer and the ice melts there. There are lakes of fresh water, in the middle of the ocean, on top of the ice. Weird, eh? But Nothing is as weird as the video following. I’m just trying to figure out who they intended to watch this video. Did they think small children, who believe in Santa Claus, would be driven by this image to run to their parents and tell them “Stop Global Warming!” ? Anyone who showed this to a child should be beaten and thrown out of society. This is PG material at a minimum and the Aimed-for demographic would have to be under age 9.
Who else could it be for? Adults seeing this must be disgusted, I was, for roughly every aspect of the film. The “Home Movie” style camera work, the “dying in a bunker” narrative, the damned Intensity of the storytelling. As if I was going to invest emotional capital in Santa Claus? Seriously? The people responsible for this video are brain-damaged. They need medical treatment for their clear inability to distinguish reality from fiction. The problem appears to be religious fanaticism. Greenpeace clearly has developed a religion based on the cult of Global Warming. The followers find some inherent symbolic link between christian religion and their own myths, this video only makes it explicit. And they’ve shown no love for children. It is a few years old now, but who remembers this gem? (i don’t really advise you watching it, it involves a child blowing up for not believing in global warming.) I do think that frightening children is part of their plan. They want to make sure that when they say something that is FALSE, Unscientific, and an unnecessary burden on their fellows – people stay quiet. In the first of these videos, these poor damaged souls are Crying out “We want Christmas for Our Religion too! Santa Claus, please save us!” If you know anyone who thinks that either of these videos were a good idea, who has strong sympathies for Global Warming Initiatives, or who wants to put up a stocking for Greenpeace….get them help. In Burnout: The mystery of Space Shuttle STS-281, Dr. Mike Anders buys a small spaceman fetish from a Zuni elder at a trading post. But there’s a story behind this little lapis spaceman carving. What is it, and how did it come to be? An ebook short prequel to Burnout. The young Zuni listened carefully to his medicine man as he prepared to set out upon his journey. “But how will I know them?” Vernon asked, worried. Vernon stared at the ancient paintings, trying to affix their details in his memory. All were tall; some had broad bodies, others narrow. All had two protrusions, like insect antennae, or fox ears, or mushrooms, on the top of the head. They all had two prominent arms, but not all appeared to have feet. Some seemed to have tails like snakes instead. In their current condition, and to Vernon’s untrained eye, it was impossible to tell whether they were coming or going, although none of them were painted in profile. Vernon nodded. He stripped to his skin, leaving his clothing and shoes behind with his mentor, and set off alone toward the peak. The only thing he carried was his whittling knife, on a thong around his neck. That night, Vernon was exceedingly glad that it was the summer solstice, for the wind on the mountain peak was chilly even so. He found the small cave, really little more than a notch in the peak, that the vision questers of his people had used for generations, and settled in for the night, although he had his doubts that he would be able to sleep. It had been a long walk, and the last hundred yards of the climb had been arduous; he was sweating profusely, and very tired. Nevertheless, he was growing cold as the sweat on his skin chilled in the breeze. He huddled near the back of the cave and tried to stay out of the wind, knowing he was going to be even more miserable very soon. Eventually, in the arid air of the high desert, his bare skin dried, and he felt somewhat warmer, although, he decided, that was relative. The sky was crystal clear, a deep blue so dark that it was almost, but not quite, black, and millions of diamonds twinkled across it. But he knew that beautiful, clear skies meant colder nights. He curled himself into a tight ball against the rock, thankful for the daytime heat that still radiated from its rough, sandy surface, and waited. Sooner or later, he knew, I will sleep, or I will have a vision. Or both. The Fetish is currently only available in Kindle format. To purchase, see Amazon.